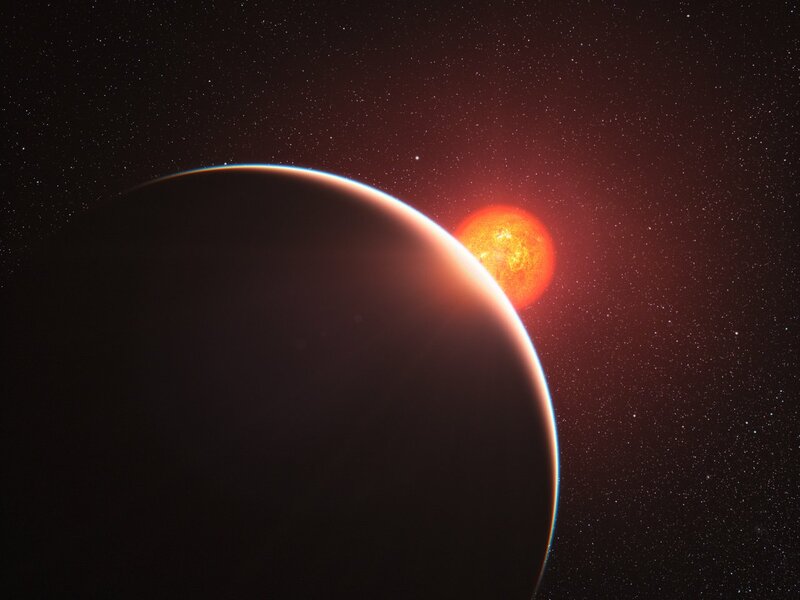 The atmosphere around a super-Earth exoplanet has been analysed for the first time by an international team of astronomers using ESO’s Very Large Telescope. The planet, which is known as GJ 1214b, was studied as it passed in front of its parent star and some of the starlight passed through the planet’s atmosphere. We now know that the atmosphere is either mostly water in the form of steam or is dominated by thick clouds or hazes. The results will appear in the 2 December 2010 issue of the journal Nature. The planet GJ 1214b was confirmed in 2009 using the HARPS instrument on ESO’s 3.6-metre telescope in Chile (eso0950) . Initial findings suggested that this planet had an atmosphere, which has now been confirmed and studied in detail by an international team of astronomers, led by Jacob Bean (Harvard–Smithsonian Center for Astrophysics), using the FORS instrument on ESO’s Very Large Telescope. 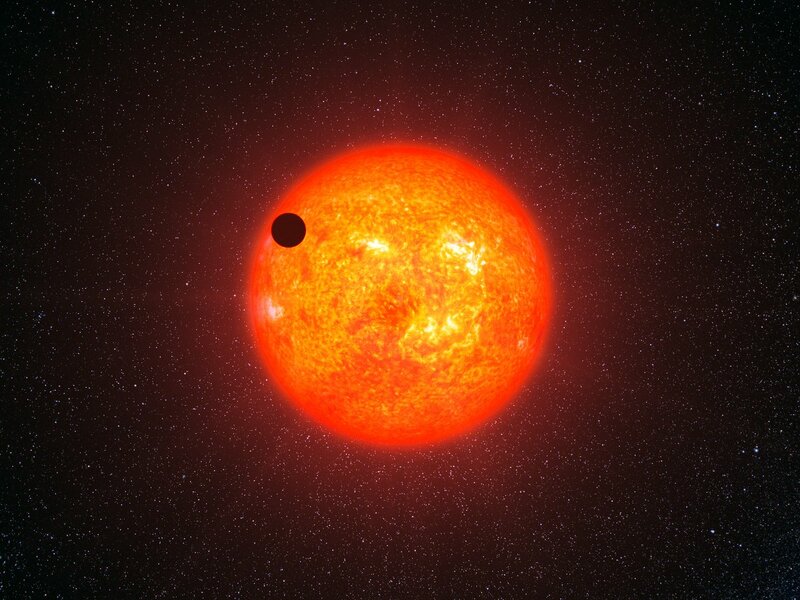 “This is the first super-Earth to have its atmosphere analysed. We’ve reached a real milestone on the road toward characterising these worlds,” said Bean. GJ 1214b has a radius of about 2.6 times that of the Earth and is about 6.5 times as massive, putting it squarely into the class of exoplanets known as super-Earths. Its host star lies about 40 light-years from Earth in the constellation of Ophiuchus (the Serpent Bearer). It is a faint star , but it is also small, which means that the size of the planet is large compared to the stellar disc, making it relatively easy to study . The planet travels across the disc of its parent star once every 38 hours as it orbits at a distance of only two million kilometres: about seventy times closer than the Earth orbits the Sun. To study the atmosphere, the team observed the light coming from the star as the planet passed in front of it . During these transits, some of the starlight passes through the planet’s atmosphere and, depending on the chemical composition and weather on the planet, specific wavelengths of light are absorbed. The team then compared these precise new measurements with what they would expect to see for several possible atmospheric compositions. Before the new observations, astronomers had suggested three possible atmospheres for GJ 1214b. The first was the intriguing possibility that the planet was shrouded by water, which, given the close proximity to the star, would be in the form of steam. The second possibility was that this is a rocky world with an atmosphere consisting mostly of hydrogen, but with high clouds or hazes obscuring the view. The third option was that this exoplanet was like a mini-Neptune, with a small rocky core and a deep hydrogen-rich atmosphere. The new measurements do not show the telltale signs of hydrogen and hence rule out the third option. Therefore, the atmosphere is either rich in steam, or it is blanketed by clouds or hazes, similar to those seen in the atmospheres of Venus and Titan in our Solar System, which hide the signature of hydrogen.. If GJ 1214 were seen at the same distance from us as our Sun, it would appear 300 times fainter. Because the star GJ1214 itself is quite faint — more than 100 times fainter in visible light than the host stars of the two most widely studied hot Jupiter exoplanets — the large collecting area of the Very Large Telescope was critical for acquiring enough signal for these measurements. GJ 1214b’s atmospheric composition was studied using the FORS instrument on the Very Large Telescope, which can perform very sensitive spectroscopy of multiple objects in the near-infrared part of the spectrum. FORS was one of the first instruments installed on the Very Large Telescope. This research is presented in a paper to appear in Nature on 2 December 2010. The team is composed of Jacob Bean (Harvard–Smithsonian Center for Astrophysics, USA), Eliza Miller-Ricci Kempton (University of California, Santa Cruz, USA) and Derek Homeier (Institute for Astrophysics, Göttingen, Germany).